You probably know the situation: It’s lunchtime at the office, your collegues are unwrapping their lunches, and you’re angry at yourself for forgetting to pack yours yet again. Now you’re off to buy one of those lame salads from the supermarket. You’ll eat it begrudgingly—all the while jealously eyeying your coworker’s meal. For this reason, we’ve collected 8 easy, on-the-go lunch recipes that you can prepare at home in a flash. Join the Lunch Fast Lane! Preparation is half the battle. Prepare lunch the evening before. This way you can save time in the morning and sleep a little longer. Recycle dinner. Simply prepare more dinner in the evening and take the rest to work! By changing one or two ingredients, you can add variety to your lunch. Wrap it up like a pro! Invest in a good lunch box or re-usable jar that can be cleaned easily. This way you’ll never experience that awkward "Help, my soup just leaked in my bag"-moment. Separate liquids. Even the best lunch idea will be ruined if your sandwich and salad is soggy or soaked through. Transport liquid ingredients separately and add them just before eating. Sharing is caring! If you have too much lunch, don’t throw it away! Someone in the office will be glad to join. This way, colleagues turn into real lunch buddies - yay! 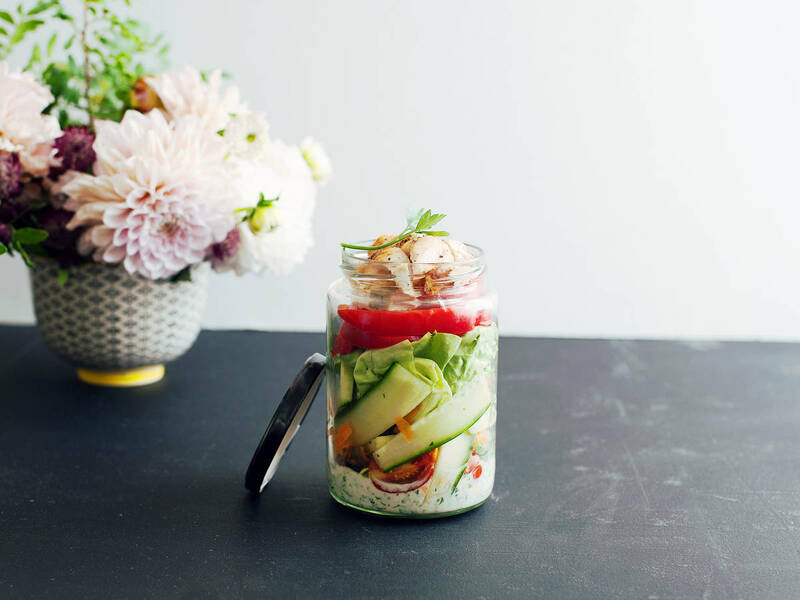 The healthy lunch: A jarred lunch is perfect for transport, eating, cleaning, and using again! This salad recipe, with chicken breast, vegetables, and yogurt dressing, is rich and gives strength for your day. Simply substitute ingredients as you wish in order to add variety. The classic lunch: We all grew up with school sandwiches, so we should nourish, cherish, and develop them for our adult palates. This chicken salad sandwich is thrown together quickly and makes pre-made sandwiches from the bakery pale in comparison. The real quick lunch: Those summer rolls stuffed with tofu can be prepared easily at home. Transport the peanut sauce separately and take credit for your great summer roll skills! The hearty lunch: Our grandparents and parents already know about the benefits of a real good lentil soup (read: cheap, delicious, and filling!). Transport safely so you only need to reheat it at the office. The sweet lunch: Well, who said that lunch has to be savory? Prepare a stack of pancakes at home, heat them up in the office, and add fresh fruits. The power lunch: Daily working routines can be quite exhausting, but this salad is here to save you. Quinoa and sweet potatoes will get you through the day and can also be easily transported as a salad in a jar. The liquid lunch: Soups are an all-round talent for every season and a perfect dish to share with colleagues. Horseradish adds a special spicy kick to this potato soup. The nourishing lunch: Running from one meeting to another one can rob us of much-needed energy. For days like this, you’ll need a substantial lunch, like this Mediterranean pasta salad with Serrano ham. Avocado—It’s What’s for Dinner…and Breakfast and Lunch!